Governor Greg Abbott remains in regular contact with leaders in Congress and the administration, advocating the necessity for funding to rebuild Texas. Expressing the disappointment he shares with Hurricane Harvey survivors that much-needed continuing federal disaster aid for Texas is getting bogged down in D.C. politics — despite repeated assurances – he will continue to urge leaders in Washington to take action. 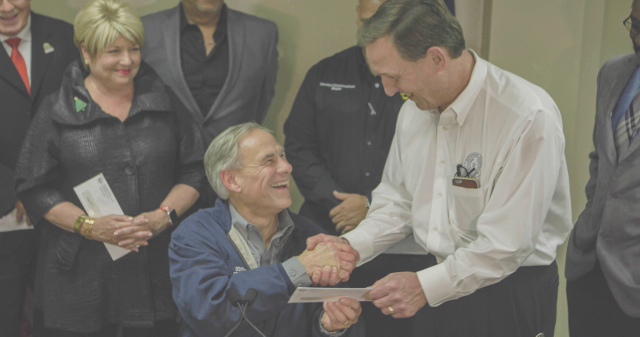 Governor Abbott extended the State Disaster Declaration for Texas counties affected by Hurricane Harvey. The 60 Texas counties declared disaster areas will continue to be eligible for assistance. More than $504 million in Public Assistance funding from FEMA for state and local governments has been obligated, and 1,115 Requests for Public Assistance have been received from jurisdictions, as of Jan. 17. As of Jan. 18, roughly 5,404 reports have been submitted from the field to the Assistance Center at Texas A&M. From those reports, the Assistance Center identified 678 issues needing follow-up or resolution, and all have been resolved. The U.S. Economic Development Association, in partnership with the International Economic Development Council, is working with the Texas A&M Engineering Extension Service to provide assistance to communities impacted by Hurricane Harvey through a network of volunteers with experience and expertise in economic development. Economic Recovery Assistance volunteers are IEDC members in senior-level and executive economic development positions. Many have hands-on experience with disaster economic recovery and have provided advisory services to other communities. Communities can apply for assistance. TDEM estimates over 11.4 million cubic yards of debris have been collected, about 64 percent of the anticipated total. More than $12.6 billion in federal funds have been provided directly to Texans, including FEMA grants to households, National Flood Insurance Program claims payments and SBA disaster loans, as of Jan 17. 246,030 individuals have visited Disaster Recovery Centers for assistance, as of Jan. 17; for current locations and mobile units visit fema.gov/DRC or download the FEMA app fema.gov/mobile-app. FEMA has completed 598,260 inspections, as of Jan. 17. A determination letter from FEMA indicating ineligibility can be appealed within 60 days of the date of the letter. For more information: Fact Sheet: Questions about Your Determination Letter. 10,212 households are taking advantage of FEMA’s Transitional Sheltering Assistance, as of Jan. 17. The TSA program providing short-term hotel stays to displaced survivors while they look for longer-term housing has been extended to March 12, 2018. If survivors are unsure of their eligibility status, they can call the FEMA Helpline at 800-621-3362 (voice, 711 or VRS) or 800-462-7585 (TTY); log into their account on DisasterAssistance.gov; or visit a Disaster Recover Center. 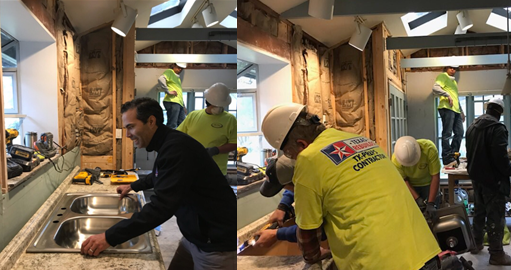 Texas Land Commissioner George P. Bush testified before two Texas House committee hearings, and then visited a Houston family whose home was damaged by Hurricane Harvey and is currently receiving repairs through the Partial Repair and Essential Power for Sheltering, or PREPS, program. More than 1,100 applicants who are potentially eligible for FEMA’s Direct Assistance for Limited Home Repair, or DALHR, program have been contacted and more than 300 inspections have been completed. 34 applicants signed contracts agreeing to proceed and currently have repairs underway. The majority of eligible applicants decline to participate because they wish to choose higher grade materials for use in their homes or wish to complete the repairs using their own contractors. As of Jan. 18, some 1,466 families have been housed through the Direct Housing Program, receiving a manufactured housing unit, a travel trailer or other resources; additional housing units are being prepped for occupancy. GLO staff joined FEMA for a Facebook live discussion of housing recovery and the DALHR program on Jan. 11. For pictures of move-in days and updates on the housing recovery progress, follow Twitter.com/TXGLO. Disaster-related job openings are available on HurricaneHarvey.jobs and WorkInTexas.com. More than 3.4 million volunteer service hours have been recorded; these can be applied to a community’s cost-share offset if eligibility requirements are met as determined by FEMA’s Public Assistance program.